Julie Larsen is a certified clinical exercise specialist and a registered dietitian. She graduated from Washington State University Spokane with a Bachelor of Science in exercise physiology and metabolism. She has been writing fro various online publications since October 2009. 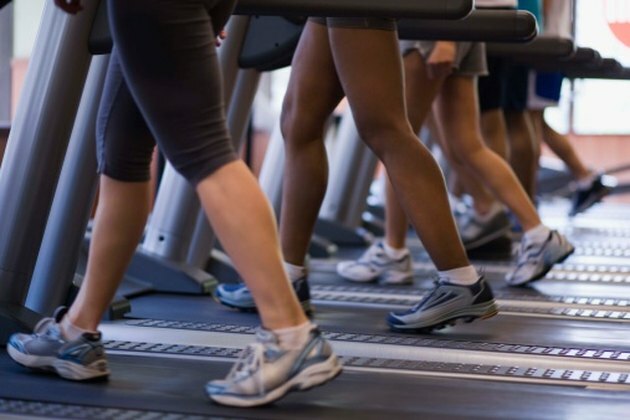 Determining how many calories you are burning while walking or running on a treadmill is not always easy. According to Clinical Exercise Physiology, the ideal calorie expenditure from planned exercise is 1,000 to 2,000 calories per week for optimum health. Although most treadmill displays will show how many calories you burned, some do not, and others are inaccurate. Fortunately, the American College of Sports Medicine has several equations that can help you determine your caloric expenditure on a treadmill. Know your speed, grade, weight and time spent exercising. Record this information on your scratch paper (Example: Speed 2.5 mph, Grade 2 percent, Weight 130 lbs., Time 30 minutes). Convert units. Your speed needs to be in meters per minute. If your speed is in miles per hour, multiply it by 26.8 to find meters per minute (Example: 2.5 mph x 26.8 = 67 meters per minute). Percent grade needs to be written as a decimal (Example: 2 percent / 100 = .02). Your body weight should be converted into kilograms by dividing your weight in pounds by 2.2 (Example: 130 lbs. / 2.2 = 59.09 kg). Write the time that you spent exercising in minutes. Complete the equation. If your speed was 3.7 mph or less, use the walking formula: (0.1 x speed) + (1.8 x speed x grade) + 3.5. If your speed was faster than 3.7 mph, use the running equation: (0.2 x speed) + 0.9 x speed x grade) + 3.5. Insert your speed and grade from Step 2 into the correct formula [Example: (0.1 x 67 meters per minute) + (1.8 x 67 meters per minute x 0.02 grade) + 3.5]. Calculate the results. Use your calculator to find how much oxygen you used. Multiply the numbers in parentheses first and then add those two answers with 3.5 [Example: (6.7) + (2.4) + 3.5 = 12.6 mL/kg/min]. Calculate calories per minute. Multiply your oxygen used in Step 4 by your weight in kilograms. (Example: 12.6 mL/kg//min x 59.09 kg = 744.534 mL/min). Dividing this number by 200 will give you your caloric expenditure per minute (Example: 744.53 / 200 = 3.72 calories per minute). Calculate total calories used. Multiply your calories per minute by your minutes of exercise to find your total caloric expenditure (Example: 3.72 calories per minute x 30 minutes = 111.6 calories). Round all your answers to two decimal places to keep them accurate and manageable. Your final number will be a close approximation of the number of calories you've burned. What Are METs on a Treadmill? How Do Treadmills Calculate Pace Times?